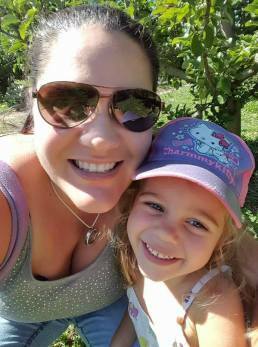 Do you ever wonder, “What did I used to do before I had kids?” It might seem like forever ago, but if you’re anything like me, your hobbies probably got put on the back-burner when your little one emerged on the scene. "The most important choices you’ll ever make are how you use your time. You can never make up the time you lose." What things do you wish you didn’t have to spend as much time on? And what would you do if you had more time? Dave Kekich was a young entrepreneur, a long-distance runner and a weight lifter, but in one day, a spinal cord injury changed his life forever. As he came to terms with life as a paraplegic, he refocused his priorities. Over the course of the next 30 years, he went on to achieve new levels of success, and wrote the Kekich Credo, which offers 100 powerful “secrets” to a fulfilled life, including the one I quoted above. 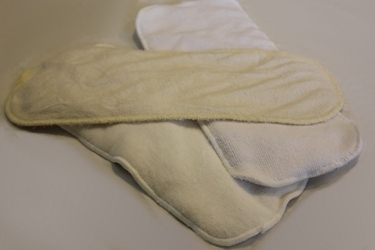 Cloth diaper inserts are not always the first thing that comes to mind when you think about cloth diapers, but absorbency is the key to diapering success! And we hear, time and time again, that one of the most confusing aspects of cloth diapers is the subject of inserts, liners, and boosters! Cloth diapers were simpler when flats, prefolds, and covers were the only options available…. Cotton was typically the only fabric choice, and stay-dry liners were basically unheard of. With textile advancements (such as PUL and bamboo, microfleece and microfiber) have come new diaper options. Pocket diapers and all-in-one designs offer convenient features that rival those only previously found in disposables, and all of this has breathed new life into the cloth diaper industry. But... (and yes, I said, “but”), these advancements have complicated our lives! Unfortunately, for a new parent, the decision to cloth diaper is now usually much easier than the decision of which diapers to buy! If you spent a ton of time doing cloth diaper research, you’re not alone! My goal with Thinking About Cloth Diapers is to make your life a little easier! I’m hoping that you can spend more time on what really matters, instead of researching cloth diapers. With this in mind, we spent a lot of time getting our full-length article about cloth diaper inserts, liners, and boosters right. I hope you’ll find that this article is a great starting point in your effort to learn more about cloth diaper absorbency. Read on to learn more about popular insert materials, understand the difference between biodegradable and stay-dry liners, and find a list of our favorite insert brands, too. Don’t miss these exciting chances to win! The Accessorize Your Stash Cloth Diaper Blog Hop runs from August 24 to 31. Click here to enter to win a set of 6 Woolzies Dryer Balls and then start your visit to more than 30 blogs for chances to win more cloth diaper accessories such as laundry detergent, wet bags, and other great prizes! Back to school cash crunch? Then you won’t want to miss this awesome giveaway! The lucky winner of the Funky Fluff Stash n Cash Giveaway will walk away with a complete cloth diaper stash of 24 awesome Funky Fluff cloth diapers (worth $500! ), and at least $300 in cash! Enter here! This year, I decided not to renew my subscription to a mainstream parenting magazine I had been receiving since my son was born 3 years ago. I didn’t think I would miss it, because I’m busy, and I read so much on-line anyway. But I recently discovered a new up-start Canadian parenting magazine, called Eco Parent. Feel free to check out a sampling from the current issue here. Even if you live outside of Canada, I think you would find value in this great publication! Eco Parent has offered a special subscription rate to all Thinking About Cloth Diapers readers. For a limited time, save 20% off the cost of an annual subscription to Eco Parent with the code: thinkingaboutcloth. I subscribed just in time for the second issue, and I’ve been so impressed with this publication. I actually decided to get the print publication (it’s hard to take my computer to the bathroom with me!). But if you prefer, this magazine offers a mobile version as well. It’s printed in full color, but it’s on a matte finish that is apparently much more eco-friendly than the glossy magazines you’re probably used to. Articles have an eco-friendly focus, but they’re still mainstream, achievable for anyone, too! Tired of trying to clean precious hand prints (aka grubby little finger prints) off of your stainless steel appliances? Thanks to Natural Mommie, I discovered an easy, and completely natural, way to clean stainless steel. All you need is a bit of vegetable oil and a soft cloth. You can read the full instructions here. My appliances desperately needed a good cleaning, and this simple solution worked wonders on my fridge and stove! I was a little nervous that the oil would collect lint or get gummy later on, but even on my oven door, it’s been fine! PS – Have you discovered our weekly cloth diaper sales round-up? 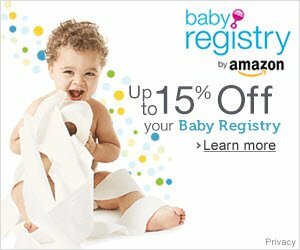 Each week, we save you time by publishing the best cloth diaper deals from our favorite retailers in one article. We’ve been publishing this fan favorite for a few months now, and what we’ve heard from readers like you is that a subscription option for this newsletter would be a welcome addition! If you like to save (and who doesn’t?) it only takes a minute to subscribe here (at the bottom of the page). From now until September 5, every Sales Round-Up subscriber will be entered to win a set of 3 Fuzzibunz One-Size Minky Inserts!